It’s all about the possibilities. 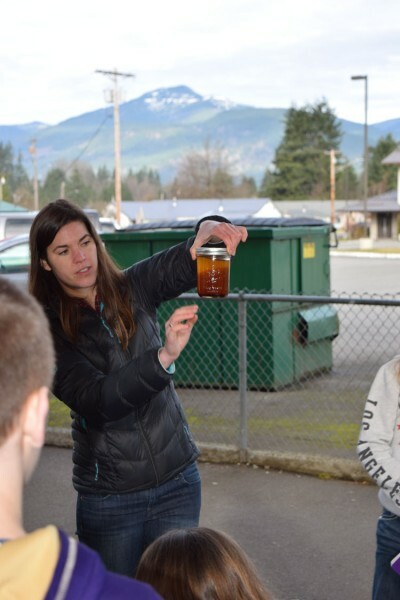 For a group of middle school students in the small logging town of Darrington, Washington turning fry grease into biodiesel opened their minds to a much larger picture of energy consumption, jobs, and the future of their community. Advanced Hardwood Biofuels Northwest (AHB) team members, part of Washington State University Extension, showed the 100 students how to make renewable biodiesel and discussed how different types of fuel impact climate change. Marina Heppenstall, AHB WSU Extension Coordinator, holds up a jar of the biodiesel to show how it separates into layers as glycerol settles to the bottom and the biodiesel is on top. Heppenstall and her colleagues demonstrated the step by step method to make biodiesel. Students helped by taking turns shaking the jar of biodiesel to complete one of the final steps in the chemical process. Being able to see the chemicals react and to test the biodiesel by burning it brought home the science message and, possibly, sparked an interest for future scientists, environmentalists, and other occupations. 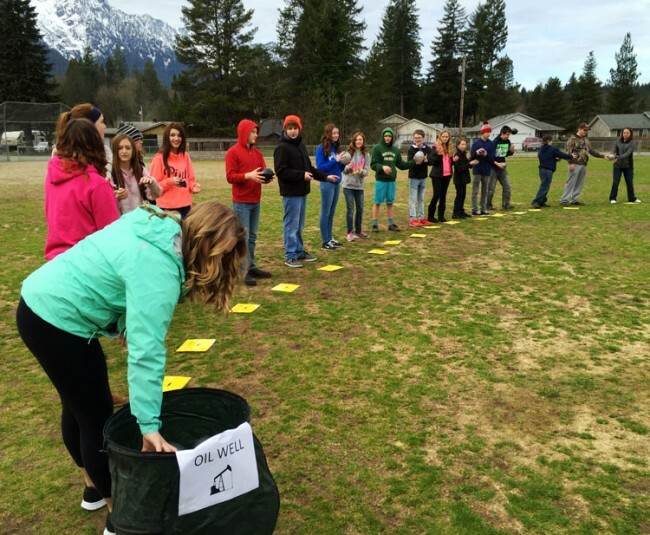 Students play a game to demonstrate the different carbon cycles of fossil fuels and biofuels. A hands-on activity with black balloons, which represented carbon, showed students how CO2 from burning fossil fuels ends up in the atmosphere trapping heat and contributing to climate change. They also used the balloons to discover how carbon in renewable biofuels creates a sustainable system as plants continue to grow and re-grow and absorb CO2.